My optimism about Alone With You, released yesterday, glided on high-soaring generic expectations set by recent retro-styled adventures like Read Only Memories and VA-11 HALL-A: excellent interactive fiction with minimal gameplay. With knockouts like those, under-appreciated genres draw in wider audiences, as I was drawn to “sci-fi romance adventure” Alone With You. Unfortunately, throughout the 3.5 hours I played, Alone With You was more of a railroad than a kite. Alone With You, on PS4 and Vita, goes easy on the romance-adventure and hard on the sci-fi, certainly not where its storytelling efforts should have been concentrated. You are the last human left on a failed space colony. It’s a wasteland of abandoned greenhouses, communications buildings and mines, where a talented cast of colonists lived and died as the terraformed planet deteriorated. You navigate these crumbling buildings and read leftover missives, solve minimal-effort puzzles and collect survival gear. You have only a computer to talk to. Gameplay is secondary: walking, picking things up, clicking through dialogue and occasional puzzle-solving. 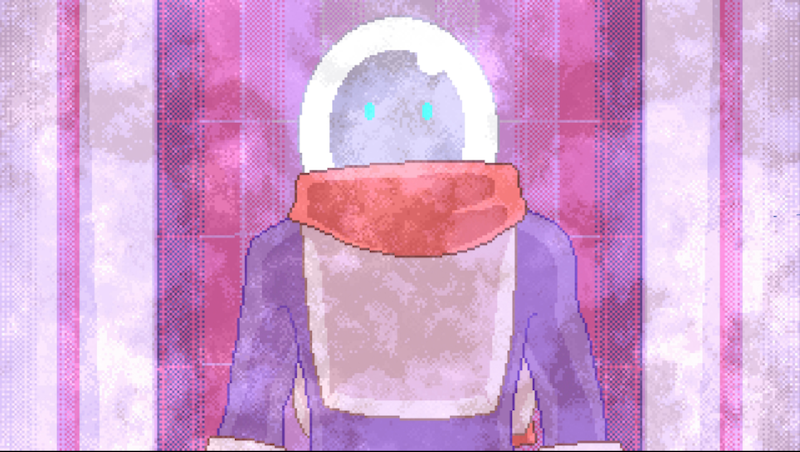 To escape the dangerous planet, you must communicate with the dead colonists’ holograms. Weirdly, that’s where the dating sim elements come in. In the holo-sim chamber, you confer in turn with an antisocial agro-dome botanist, a hubristic engineer, a dweeby-looking communications expert and an ethically-conflicted resource manager. These moments of intimacy are surely fulfilling for the sims, who ramble endlessly about their life stories. But your character is limited to three dialogue options, generally bland affirmations or one-word questions (“I get you,” “How so?”). I expected that the game’s romance elements would keep me interested, since it is one of Alone With You’s defining qualities. As a lonely space explorer with only a computer to converse with, I expected that any human contact would provoke a rush of personality. But, like the agro-dome botanist Leslie Bharadwaj, our conversations were sterile and dead. After cycling through all your dialogue options, and all their possible responses, you go to bed. Rinse, repeat. In retro adventures Read Only Memories and VA-11 HALL-A, my character’s driving characteristic was skepticism, an easy guide through a dystopian world-building exercise. In Alone With You, my avatar had no defining qualities at all. Regardless of the game’s gorgeous graphics and excellent world-building, the lack of engaging gameplay mixed with railroad-y conversations had me somewhat bored. I even felt a little lonely. Expecting a connection and not getting one is isolating, even if that connection is with an NPC. I quit playing a few in-game days in (about 3.5 hours). I’ve read that the game’s last mission is quite interesting, yet a third of the way through Alone With You, I found no sticking point. As we’ve learned from The Martian, living in space requires a lot of drudgery and repetition, so it’s possible that the game was true-to-form. But, if you want a story-heavy, minimal-gameplay adventure title with a retro aesthetic, there are better options.